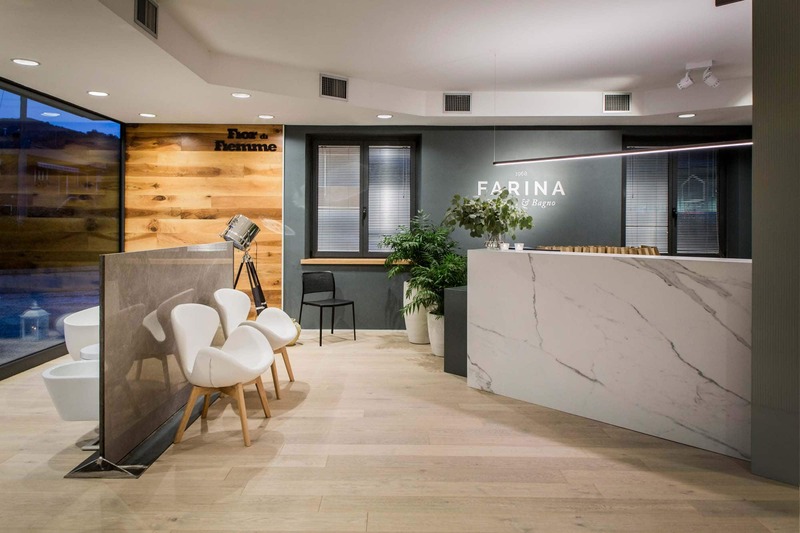 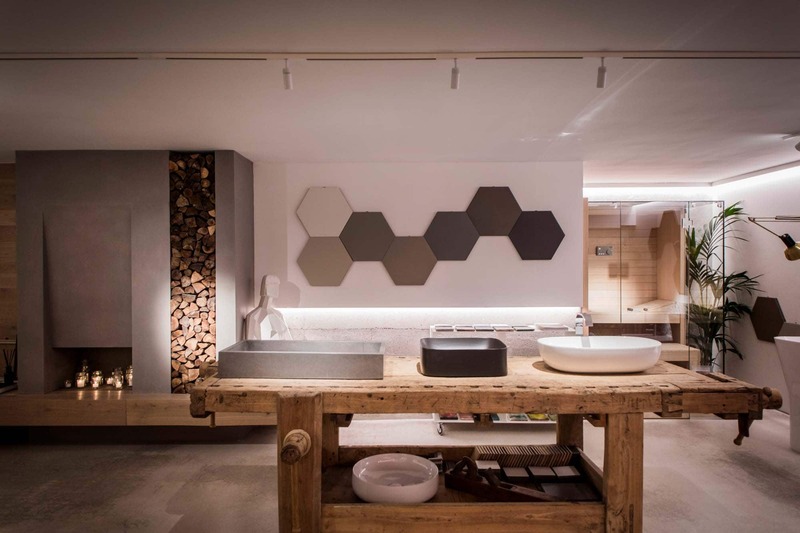 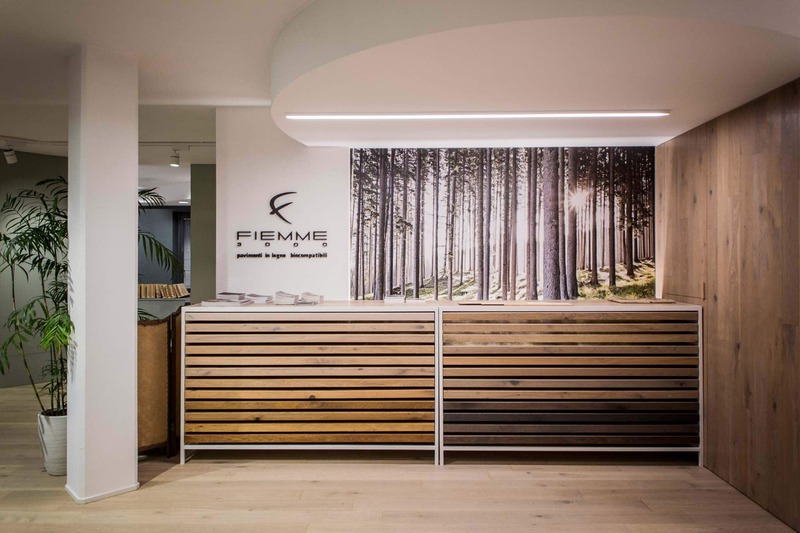 Manuel Farina tells about the new Farina Superfici & Bagno showroom extension project. 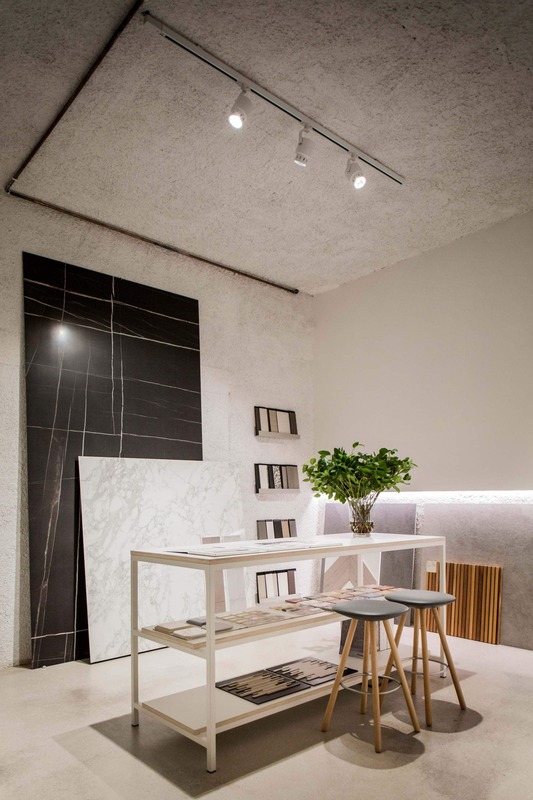 An exhibition area dedicated to designer surfaces, where Olev lighting creates the warmth of a home, rises now from the old halls that used to be a warehouse. 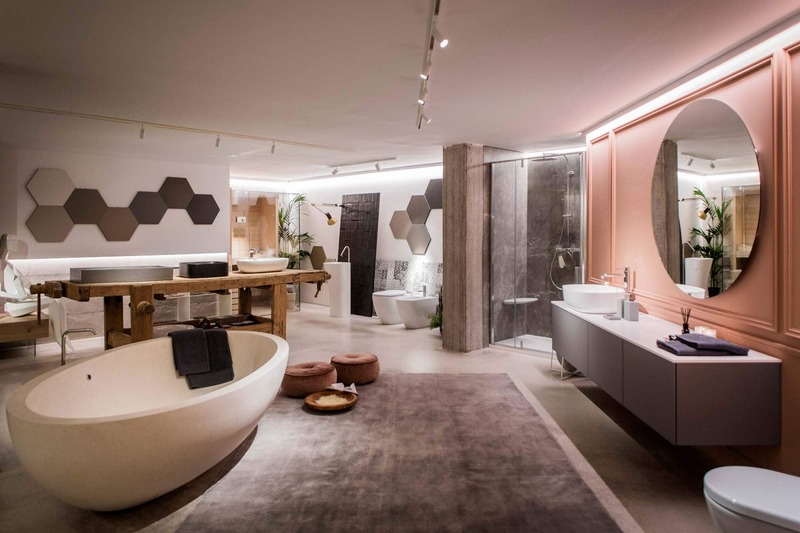 The project was developed by the internal team of designers in collaboration with Architects Matteo Munaretto and Giorgio Parise. 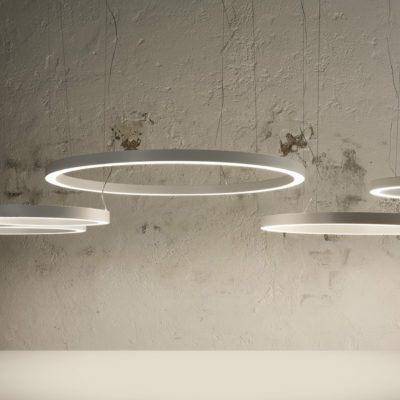 Lighting was an extremely delicate matter. 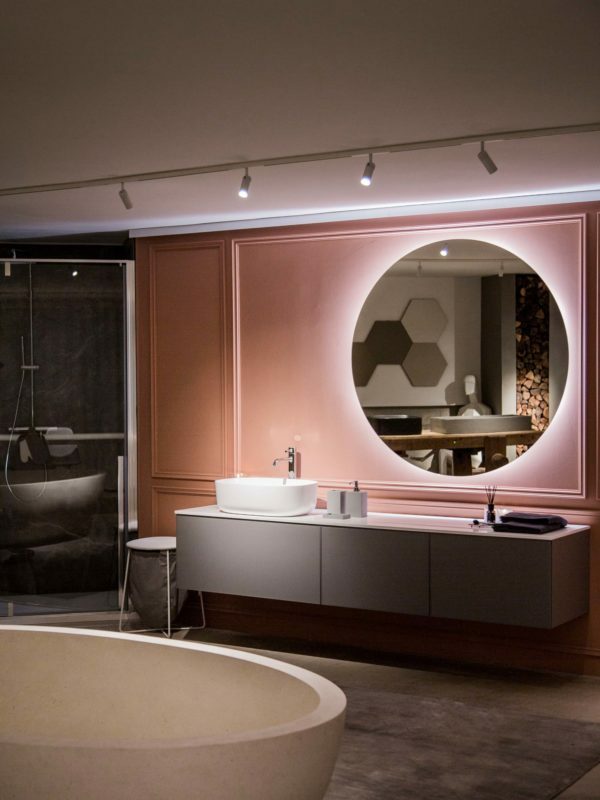 The light had to accentuate the colours, the grain of the materials and the decorative details of the surfaces on display, still without appearing cold and impersonal. 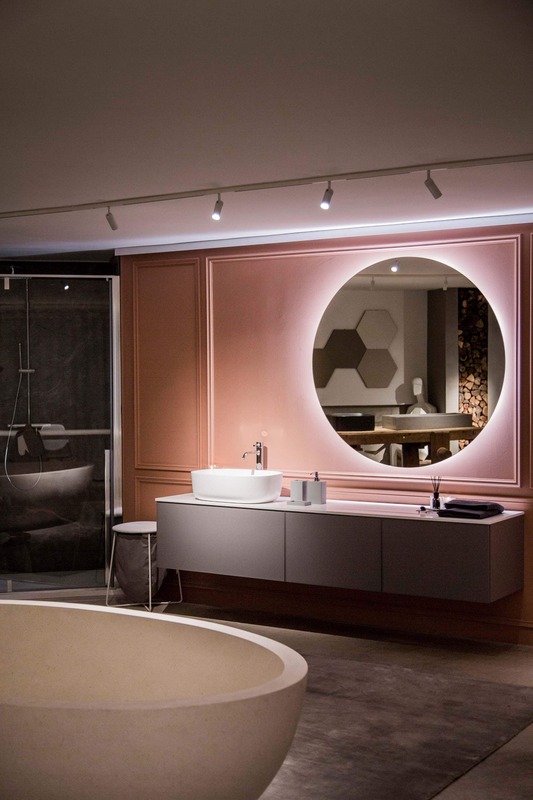 Thanks to the Olev team, the final result is amazing and inspiring. 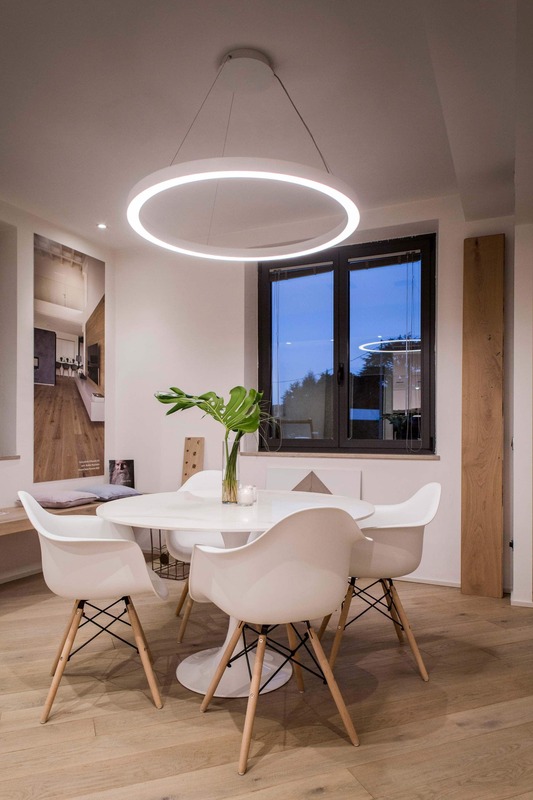 In the area dedicated to wood flooring, a smooth light exalts the natural grain of the material and provides a faithful colour rendering. 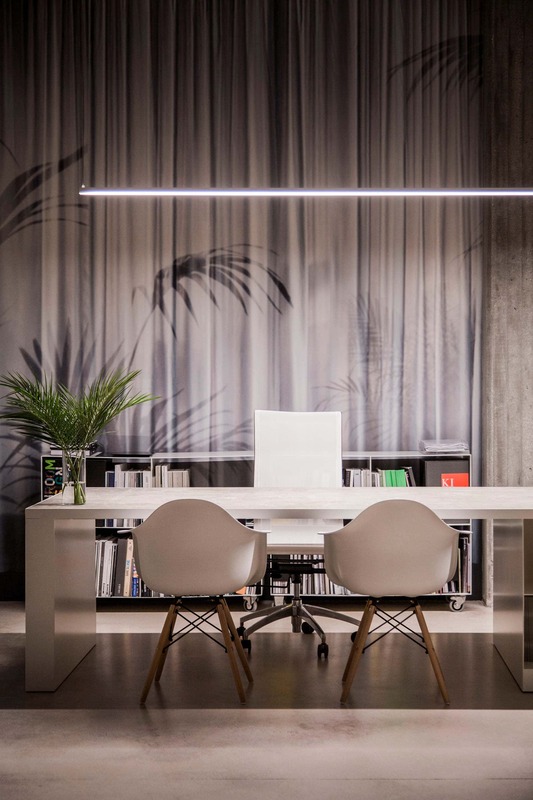 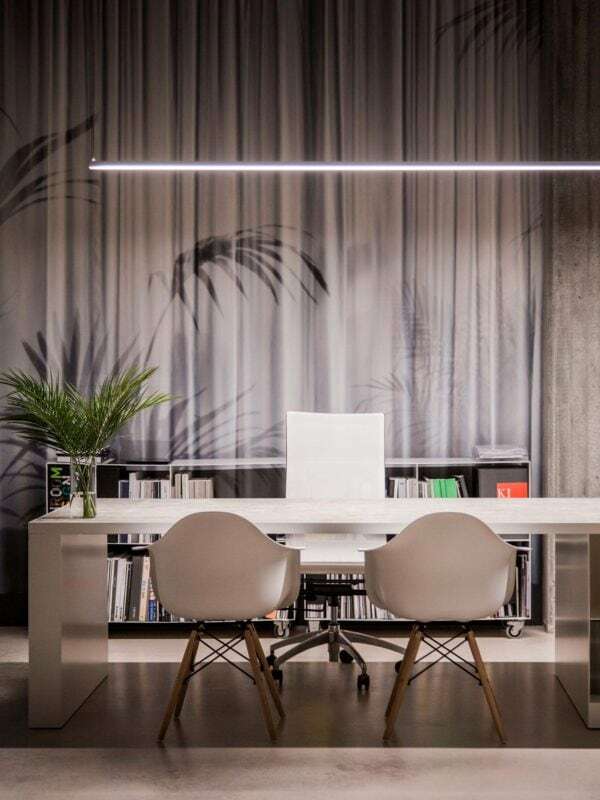 The designers have chosen Profil18 for the two workstations – a pendant profile with a double LED strip running along the entire table. 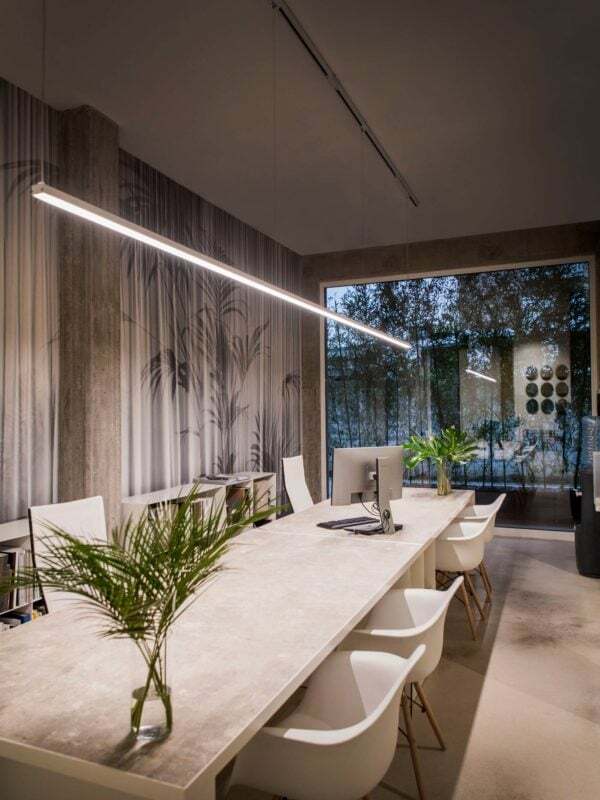 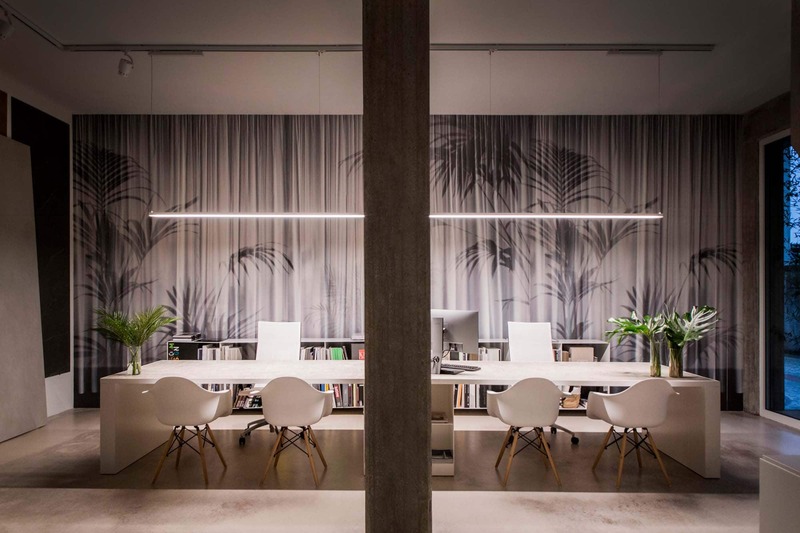 Profil18 spreads the perfect light for professional consultancies, creating an atmosphere which is ideal for concentrating on computer work and grants a high visual comfort. 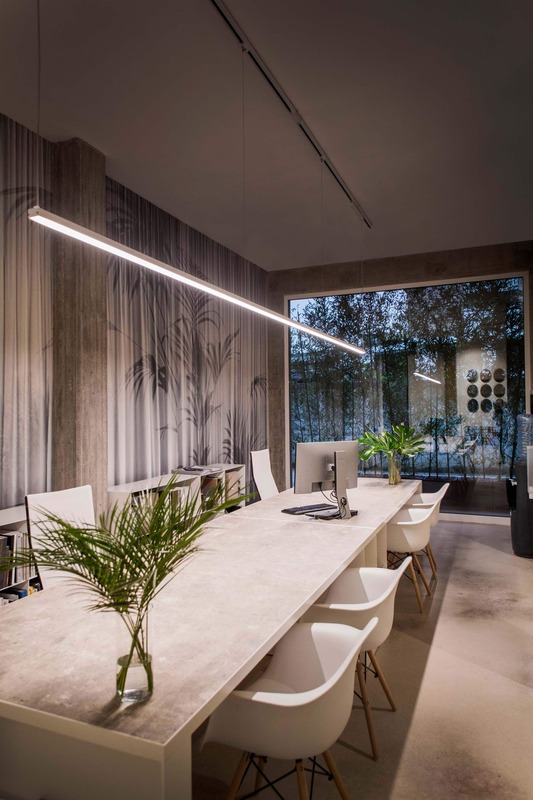 The reception is the area where the first contact between the client and the company takes place, but it is also the front office workspace. 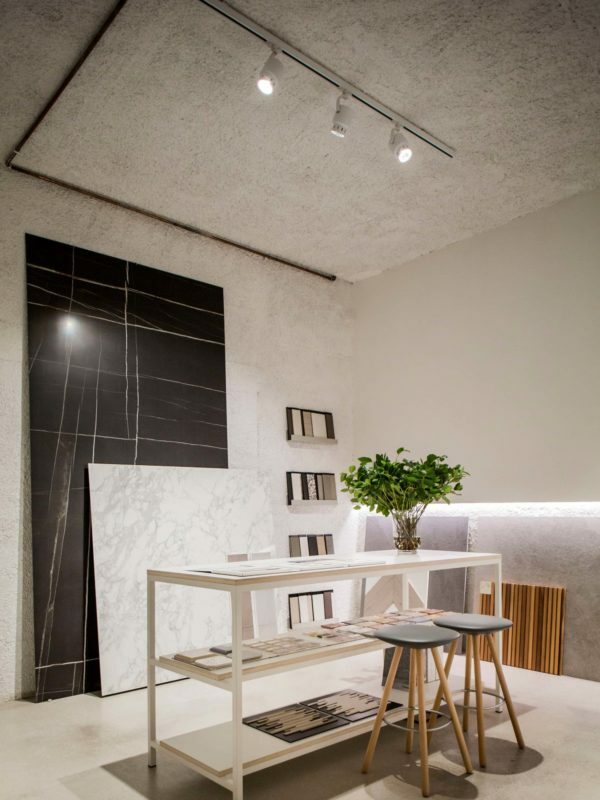 Profil18 illuminates the elegant light marble counter with a functional and focused light. 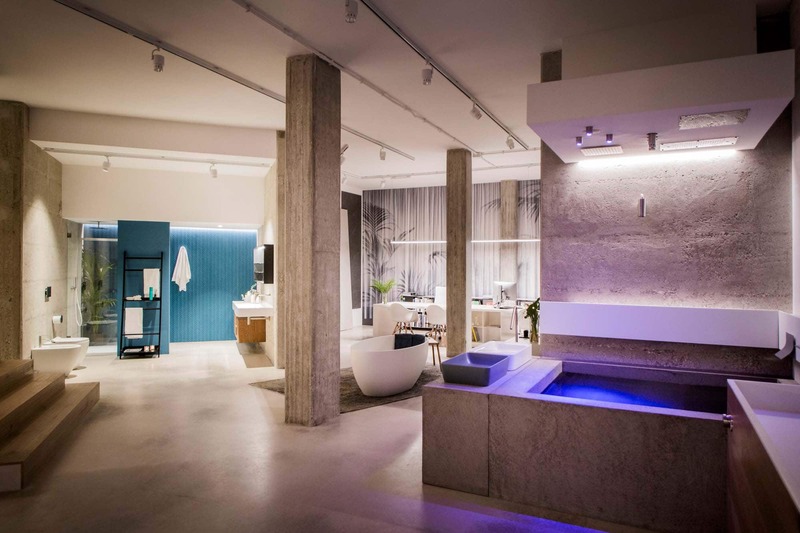 In the lower showroom area, you can find spaces dedicated to the kitchen/livingroom, bathroom and wellness. 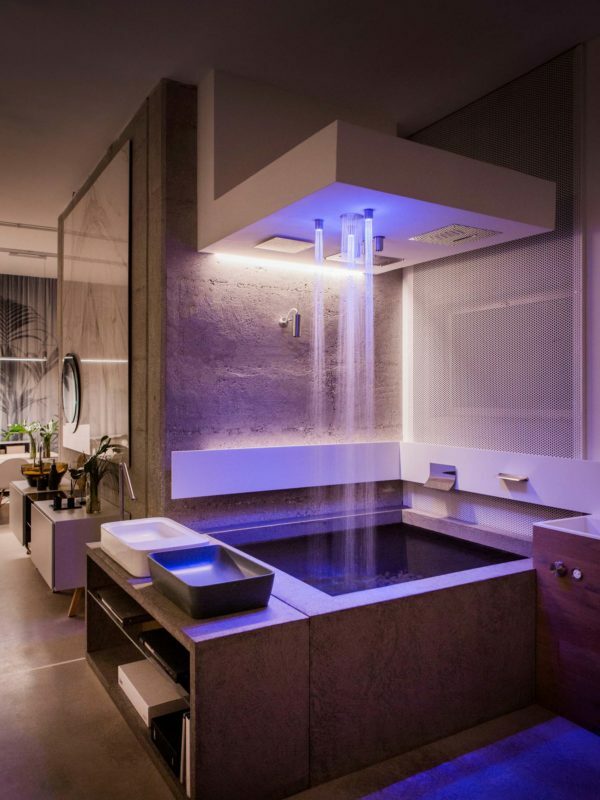 A designer shower box strikes with the beauty of its lines and the quality of the materials. 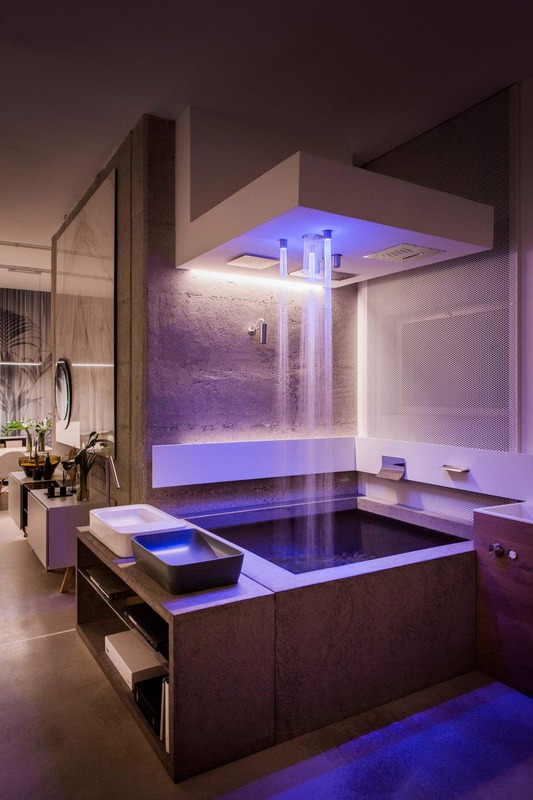 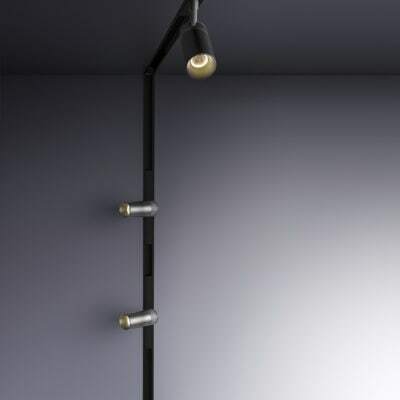 The LED lights enhance the aesthetics of the shower creating coloured water jets. 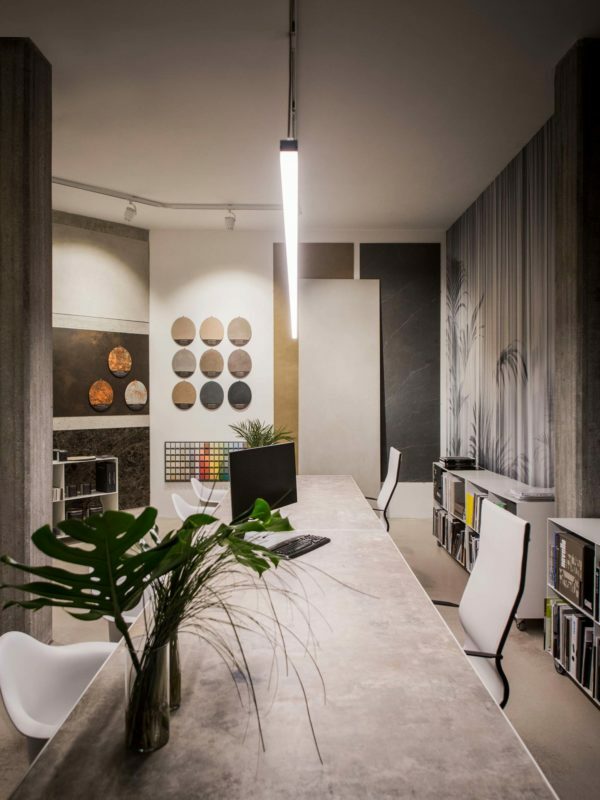 On the wall, a grazing light caresses the exposed concrete, providing a feeling of well-being and relaxation. 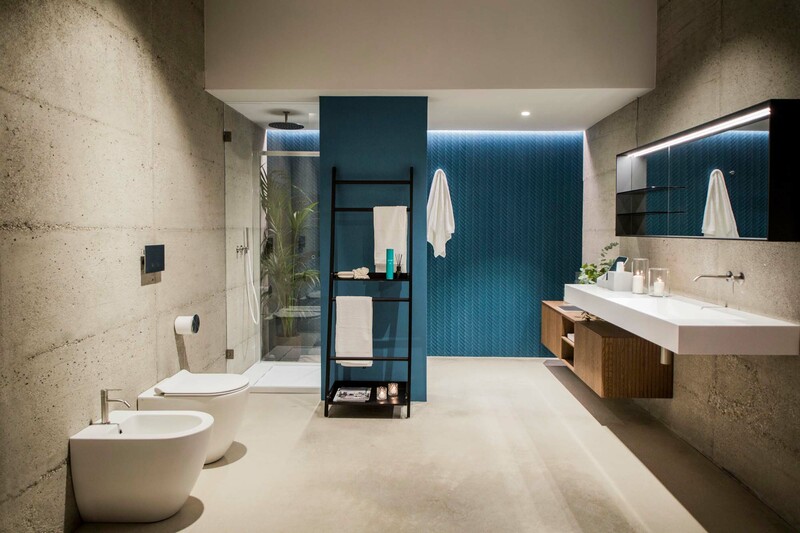 The proper illumination of the bathroom is granted through a balanced combination of direct and indirect light. 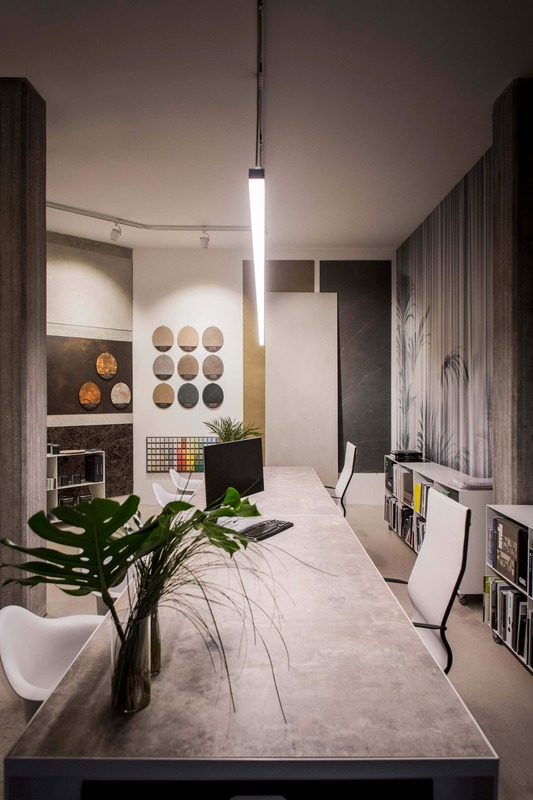 In the different settings on the ground floor, the spotlights on the ceiling direct the attention of the guests towards the surfaces and the materials on display. 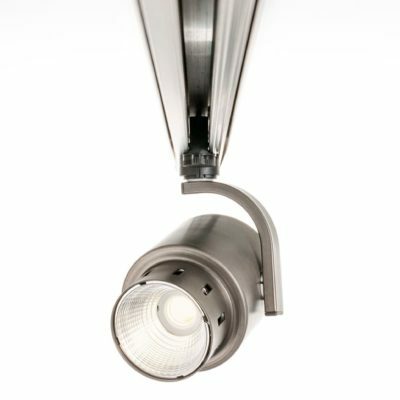 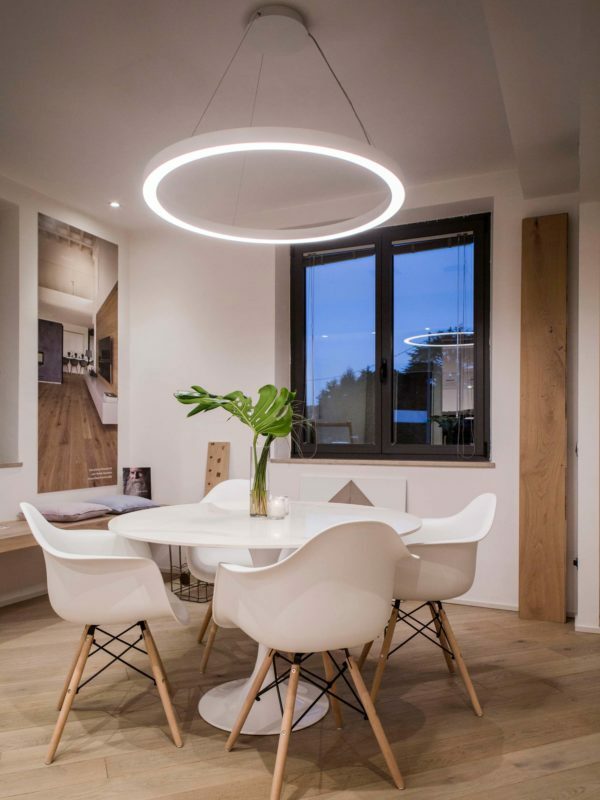 These adjustable spotlights mounted on tracks with classic or magnetic coupling allow to adapt the direction of the light beam to possible variations in the arrangement of the furniture.